You might not expect to find a decent music guide in a 70s teen girl magazine, but that's exactly what I came across in the November 1974 issue of an American publication called The New Ingenue. 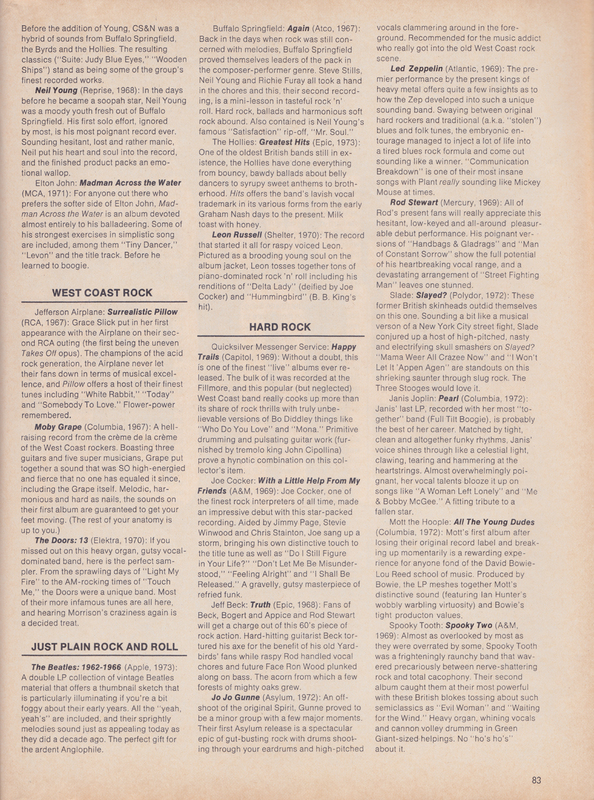 In "50 Albums You Can't Live Without", the magazine does not condescend to its young female demographic with the usual list of tight-jeaned teenybopper pin-ups, but instead presents a serious guide for fledgling collectors. 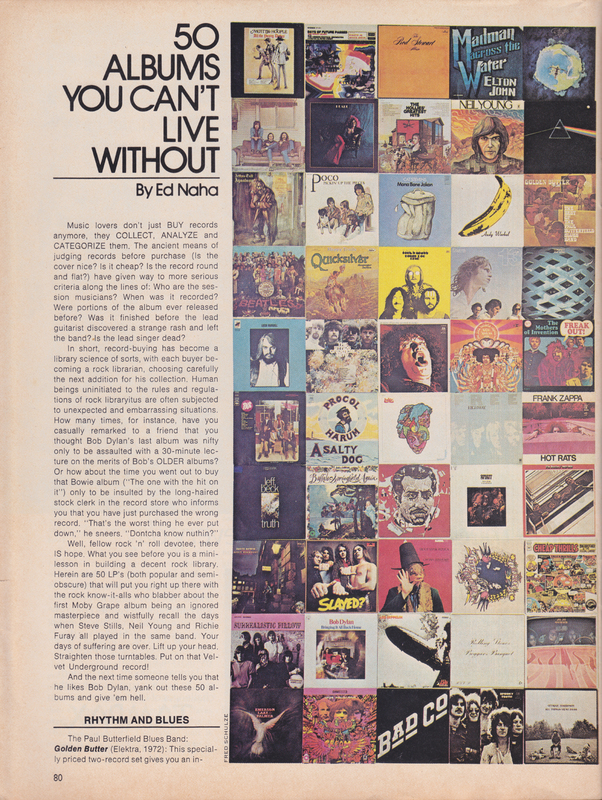 It was written by Ed Naha, at the time a music journalist who wrote for esteeemed publications like The Village Voice and Rolling Stone, and who later became a science fiction and fantasy author and screenwriter. The article is not only an interesting snapshot of its era, providing a glimpse into critical tastes as well as the culture of record collecting at the time, it still works as a great starting point for anyone wanting to explore 60s to 70s rock. 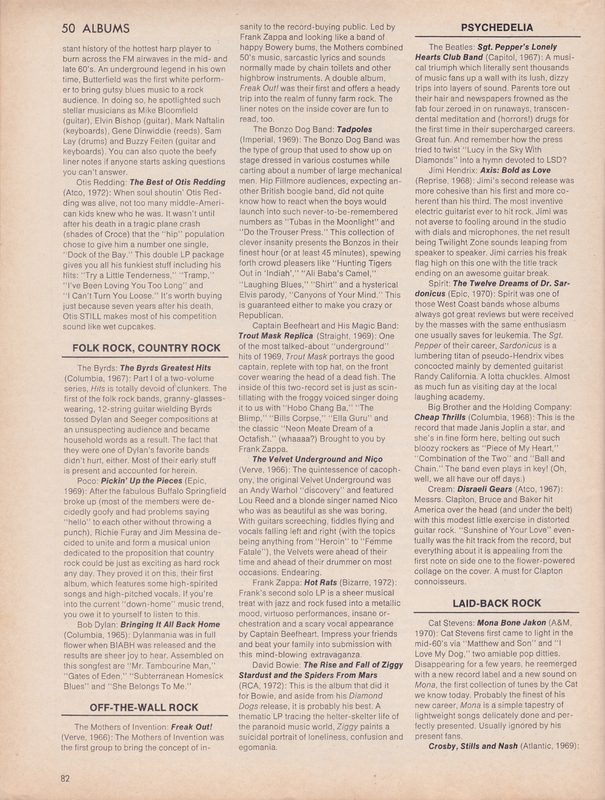 The list covers a good range of styles, from rhythm and blues to "lofty rock", though for my tastes, it's weighted a little heavily toward hard rock – not surprising given when this was written. While it's filled with staple classic albums like Dark Side Of The Moon and Sgt. Pepper's Lonely Hearts Club Band, it also has a few more obscure choices that have since fallen off the critical radar. Then there is something like Love's Forever Changes, which was not a success when released, but whose reputation saw it rise to become a cult classic over time. Here we see it beginning to achieve this status, as well as the insight that it "attracted a lot of praise and condemnation" at the time of its release. The New Ingenue seems to have been trying to do something more progressive and feminist with the medium of the teen girl magazine. Among the usual makeup ads and fashion tips, there are some atypical articles that show they expected intelligence from their audience, like a feature on the juvenile detention system or a technical guide to hi-fi. A subscription ad boasts the magazine has a broad range of content, with "columns on crafts, ecology action and all the occult" (all of it!). Describing their target reader, it says "she isn't under anybody's thumb and she's not up on anyone's pedestal". I bought several issues from the collection of the lovely Dixie Laite, who described The New Ingenue as "sort of a precursor to Sassy in terms of content, attitude and down-to-earthiness." 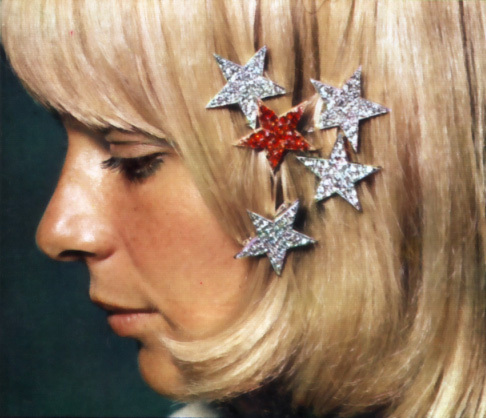 As part of this approach, the magazine had a particular interest in bringing quality music journalism to young women. I found an advertisement in a December 1974 issue of Billboard magazine which emphasised The New Ingenue's commitment to musical content. 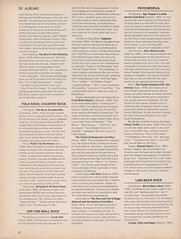 It proudly proclaims the magazine's line-up of respected critics, that its music column is "not a monthly gossip column" and that it features "the first and only chart designed by and for the young American woman". 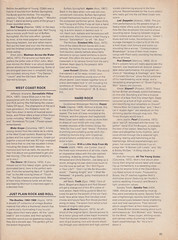 Continue reading "from 1974: 50 albums you can't live without"